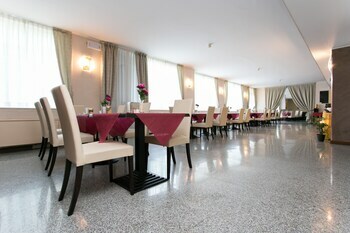 Located in Gerenzano, Hotel Concorde Fiera is connected to the convention center and convenient to Teatro Giuditta Pasta and Parco degli Aironi. 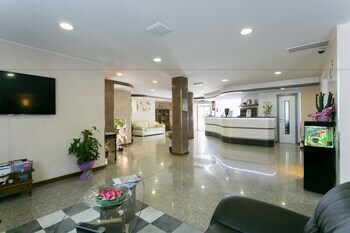 This 4-star hotel is within close proximity of Church of St Francis of Assisi and Saronno Hospital. Take in the views from a garden and make use of amenities such as complimentary wireless Internet access and concierge services. Additional amenities at this hotel include an arcade/game room and a television in a common area. Getting to nearby attractions is a breeze with the area shuttle (surcharge). Enjoy a meal at a restaurant or in a coffee shop/café. Or stay in and take advantage of the hotel's 24-hour room service. Quench your thirst with your favorite drink at a bar/lounge. A complimentary buffet breakfast is served daily from 7 AM to 10 AM. Featured amenities include a business center, express check-in, and express check-out. Planning an event in Gerenzano? This hotel has 861 square feet (80 square meters) of space consisting of a conference center and a meeting room. A roundtrip airport shuttle is provided for a surcharge (available 24 hours), and extended parking is available onsite. Hotel Concorde Fiera is the perfect Gerenzano lodging choice for your trip to Italy. With numerous amenities for guests such as 24 hour front desk, concierge, game room, you will wake up at Hotel Concorde Fiera feeling refreshed every day for your time in Gerenzano. Don’t let this amazing reservation opportunity pass you by, book your stay at Hotel Concorde Fiera today to make the most of your time in Gerenzano, Italy.